Festival Of Colors: The Celebration Of Holi Sunday marks the beginning of Holi, the Festival of Colors, a holiday observed by Hindus around the world. Commentator Sandip Roy has childhood memories of smearing himself with paint for the festivities in India. Nowadays, Hindus aren't the only ones getting in on the fun. 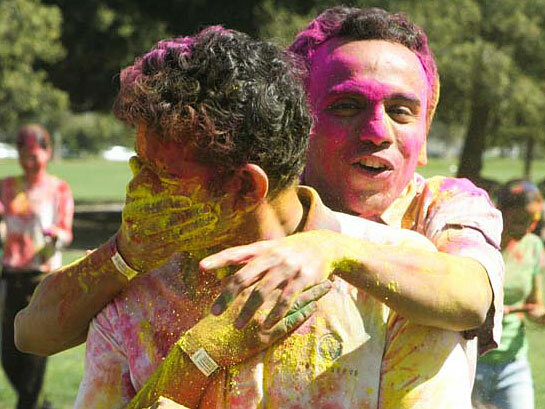 During a Holi festival celebration, like this one at Stanford, commentator Sandip Roy says young people explode in water pistol fights that leave everyone drenched in eye-popping purple and shocking pink. Holi, the festival of spring, is meant to be danced in the streets. It's about groups of young people exploding in water pistol fights that leave everyone drenched in eye-popping purple and shocking pink. It's about buckets emptied over your head. By the time it's over, even the stray dogs on the street are pink. It's noisy. It's wet. It's a riot. Mohit Saigal says, "I remember from our balcony throwing water balloons filled with color and water, and throwing it at people outside on the street." Mohit is too well-behaved to do that anymore. He volunteers with Asha for Education, a nonprofit that supports education in India and puts on a Holi festival at Stanford University. Asha will hold this year's festival March 27. More than 4,500 people showed up last year, some flying in from across the country. Many aren't even Indian. "First time, first person I put color on was a female police officer who comes there every year," recalls Mohit. "She was Caucasian." Our Holis in India didn't require much prep. We'd put on our rattiest old T-shirts and go down to the market where the vendors sat with pyramids of colors piled in front of them. Asha's Holi needs a U-Haul for its 5,000 pounds of paint. Mohit's friend Poornima Parameshwaran, a doctoral student at Stanford, says that's still not enough. "The crowd is definitely a little displeased when color runs out," she says. "They handle it in the spirit of Holi. They don't riot. They switch to playing with water instead. Just plain water coming out of a hose." When I was a kid, if people asked what kind of colors we got, we'd say red, blue, pink. Now, Mohit says, "Safe colors, starch-based vegetable colors." In India these days, parents worry about paint with lead and mercury. Some make skin-friendly colors from henna and marigolds and beets. But all the colors leave a mess. When the festival is over, Mohit and his crew hose down the fields of Stanford and return them to their original green. It's not as easy to return yourself to your original shade, says Poornima. "You definitely have to scrub for at least an hour that night after you get back to get it off you, your nails, off your skin. After you get it off, you have to get it off the bathroom floor. Definitely an ordeal but, hey, worth the fun." Maybe what's most fun is that for one day, 4,000 people gather together and drench each other in so many colors, you can't tell what color anyone is anymore. You could say it's a glimpse of a new America — not black, brown or white. "Pink, green, orange, purple, yellow," says Poornima.